Some users believe that the android devices are not as trendy as blackberry or iPhones; however their popularity is increasing by leaps and bounds. Developers and designers enjoy creating new few apps for the android market. Designers with a smartphone or a tablet operating on android OS would be definitely interested by the following mentioned free apps. Read further to know the top free android apps developed specially for designers. Many analysts predicts that Android will be the no. 1 mobile OS by 2015. So I think if would be good for you if you don’t be too late to start. Fontest is a typical typography tool that has been designed especially for the developers. The app allows you to get a preview of how the fonts would be displayed on android devices. 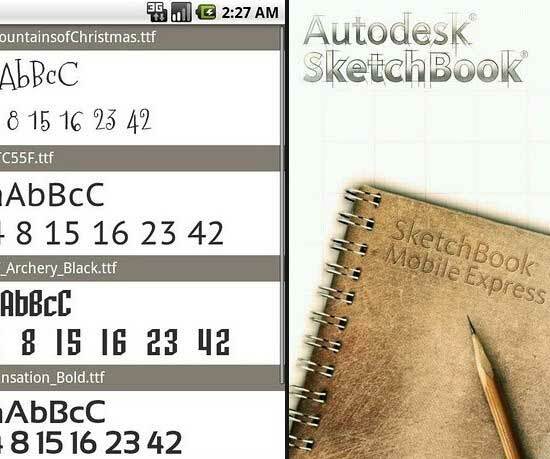 Sketchbook mobile express is one of the most popular drawing and painting application available in the android market. It allows the designers to craft quick sketches using their mobile device. Don’t be surprised, this version of adobe photoshop is not exhaustive, on the other hand it is a practical tool that is used for editing the images. According to me, Thinking space is one of the most innovative applications in the android market. It has some decent graphics and a well-thought user interface. Mind mapping helps the designer to organize your ideas. AndFTP is a complete FTP client that has been developed for android devices. This application supports SFTP, FTP, SCP as well as FTPS. It also allows you to manage various FTP servers. SilverEdit is a popular web files editor developed for android. The application comes with syntax highlighting. It is a simple FTP client and has much other functionality. Magic color picker is basically a color selection tool that is suitable for artists, designers, and programmers. It is used for selecting colors by using various color models. The application supports seven different modes as well as RGB, HSL, HSV, and YUV color models. Typography junkies application helps you to stay updated with the very latest happening in typography. It provides latest font news on your android device. View web source application is used to check the source of web pages. Using this tool you can also search for text, select text, and copy and paste the HTML, etc. The color dictionary application is a reference of colors that provides various options such as RGB, CMYK, HEX, Lab values, etc. The application also provides detailed color analysis. ActionScript reference app indexes the adobe AS3 help documents for Flex and Flash developers. People working with Flash and Flex software will appreciate this application, as it saves lots of time, efforts and is a very handy tool. Flubble is an interesting app that is primarily developed for Flash developers. It helps in creating shell classes and outlines when you are working in the flash applications. You can save and e-mail your work as an ActionScript file and in a XML format as well. WordPress app for android helps you to maintain your wordpess through your smartphone. It is an open source, which allows you to edit content, write new posts and manage comments. Mentioned above are few of the apps, while there are numerous other interesting apps as well. If you have any other suggestions, feel free to comment below. You can download all these apps from Android Market. About the author: Rebecca is a blogger by profession. She loves writing on luxury and technology. Beside this she is fond of Short Evening Dresses and gadgets. These days she is busy in writing an article on Refracting Telescope.